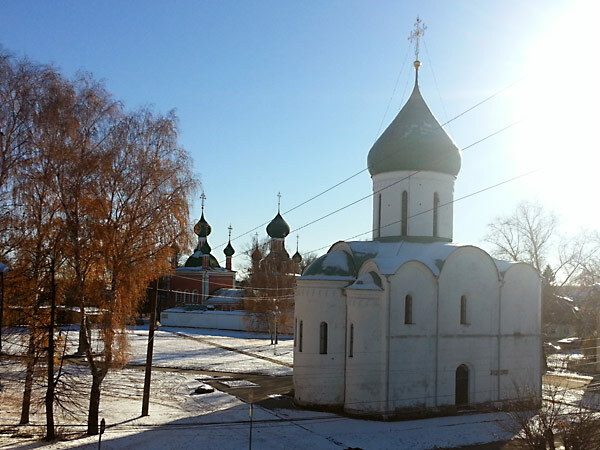 80 kilometers drive and we are in Pereslavl-Zalessky – town founded in 1152 by Yury Dolgoruky. This duke established Moscow in 1147. We stopped for lunch at very nice restaurant “Botik Petra” with a view to the huge Lake Plescheyevo which is endless like a sea. Here we saw very old church – Trinity Cathedral which is the same age as the town – was built in 1152. We continued our journey towards to Rostov Veliky. First mention of this small town located on the shores of Lake Nero refers to year 862. 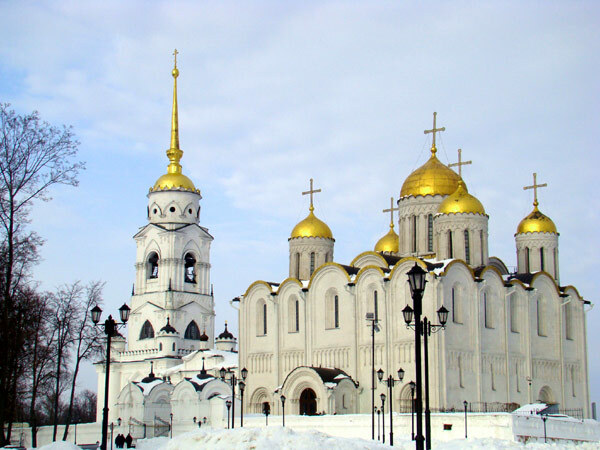 The central square of Rostov is occupied by the Assumption Cathedral. The church in surrounded by the Kremlin walls. Inside the Kremlin there is a small workshop where different souvenirs made of clay are produced and sold. Our first trip day was nearly over and we – all full all impressions and pleasant tiredness - left for Yaroslavl for dinner and overnight. 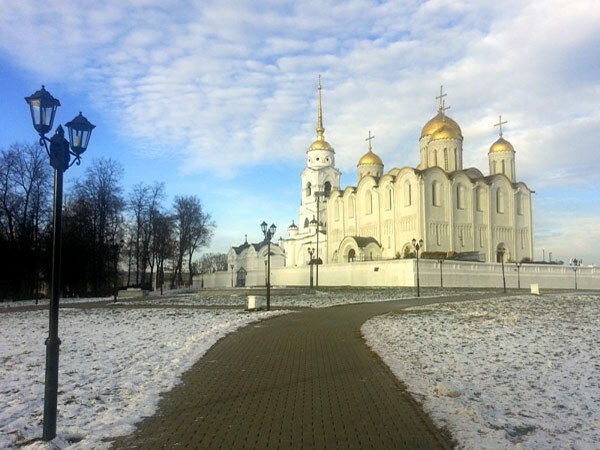 Early morning of Yaroslavl met us with minus 19 degrees and the brightest welcoming sun. We started our orientation tour with the unique church – St. John the Baptist Church. Its walls and dome drums are covered with richly glazed tiles, the temple's fifteen onion domes are assembled in three groups. What is interesting that the church is featured at the 1000-ruble banknote. 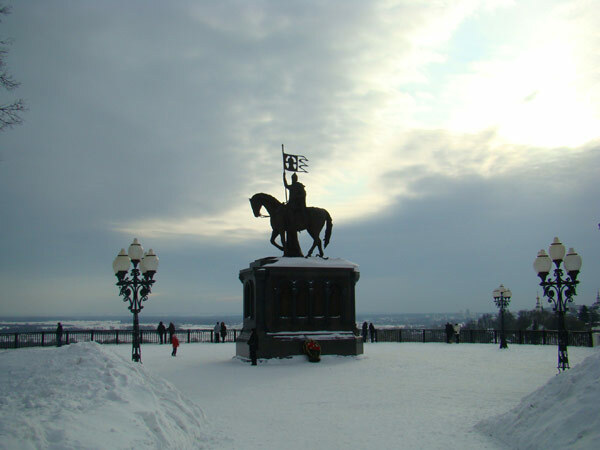 Then we proceeded to St Saviour Monastery – Old Russian literature monument “The Lay of Igor's Raid” was found here. We had to say “Goodbye” to Yaroslavl and go further as out next point was Kostroma. Town is located at the confluence of the Volga and Kostroma Rivers. In the evening this old and small town looked very nice and cozy. 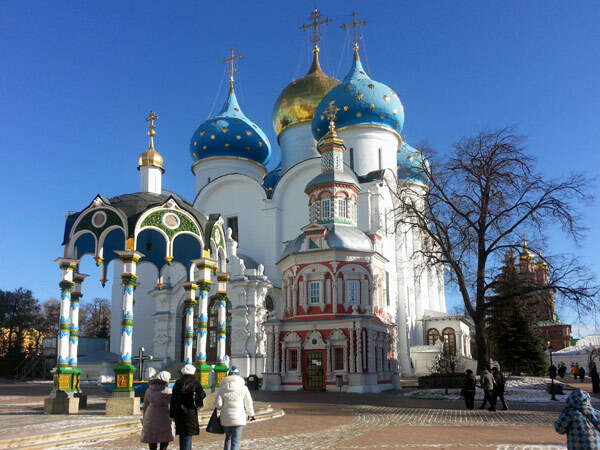 We visited two acting monasteries – male Ipatiev Monastery and female Bogoyavlensky Convent. Restored Romanov Boyar Palace is located in Ipatiev Convent and is worth visiting for sure. After dinner we stayed for overnight in Kostroma to continued our trip in Vladimir on the following day. Way to Vladimir took almost 3,5 hours – 220 kilometers. Our excursion started with visit of Assumption Cathedral and Cathedral of St Demetrius. The last one belongs to the World Heritage of UNESCO. Of course we passed through Golden Gates – the main city’s gate which had a defensive aim. This object belongs to the World Heritage of UNESCO as well. 26 kilometers from Vladimir Suzdal is located. Ancient town on Kamenka River. The history of the town dates back to at least the year 1024. We visited Saviour Monastery of St. Euthymius there with entrance to Transfiguration Cathedral which has amazing interior walls. Another “must visit” sight of Suzdal is Wooden Architecture Museum. Containing about twenty reconstructed wooden buildings, including a windmill, taken from the local area and dating back between 200 and 300 years, this 'living museum' tries to help you imagine more what life was like for the average Russian peasant. And of course we couldn’t come by the heart of the town – Kremlin which is much smaller than most of the monasteries and convents which were built in the town some centuries later. On Suzdal we stayed in Russian style hotel complex which offers two types of accommodation – classic rooms of merchant style and wooden cottages designed in Russian “izba” style. We managed to taste some traditional beverage – mead or “medovukha”. That is a beverage made of water, honey, sugar, barm and hop. It’s low-alcoholic and even healthful within due limits of course! We were really surprised by the number of different gust houses and small private hotels which number and quality are increasing. Some of them have boutique design and very cozy interiors. Our driver Victor deserves individual attention as he drove us everywhere so fast and accurate that we wasn’t late anywhere and managed to see even more than we planned. So full of impressions of this part of Real Russia we go back home to noisy and busy Moscow – tired but very happy!